A useful demo that shows how to use our KeyLines Angular component. Angular is great for simplifying the way you develop and test your graph visualization application, but, until recently, getting started with the framework took some effort. You had to start from scratch for every Angular project – setting up the project structure, manually configuring tools, dependencies and test frameworks, managing modules, optimizing builds and so on. It’s all necessary, but the time it takes would be better spent writing code. Angular Command Line Interface (CLI) makes setting up and working with Angular projects much faster and easier. You get all the benefits of a modern, front-end development tool – including hot-reloading, compiling TypeScript, module support, testing and deploying – without the heavy lifting. The Angular team released their CLI tool back in early 2017. It’s designed to help Angular web developers automate their workflow, make projects more consistent, and follow best practices. There’s complete documentation available from the Angular CLI GitHub wiki page. This blog walks you through the commands you need to integrate Angular with KeyLines and start coding. Let’s start by creating a new project. First, make sure you’ve got Node.js installed (you’ll get npm in the download too). The project is now set up in the ‘my-project’ directory. It already contains all the necessary configuration files and some TypeScript modules to get started. Every time you create a new component, you’ll be adding the main bulk of code to the src/ folder. You’ll see there’s already a component in there called app. Now let’s add KeyLines to the new project. Move js/keylines.js into the src/ folder. This is the main library containing KeyLines functionality. 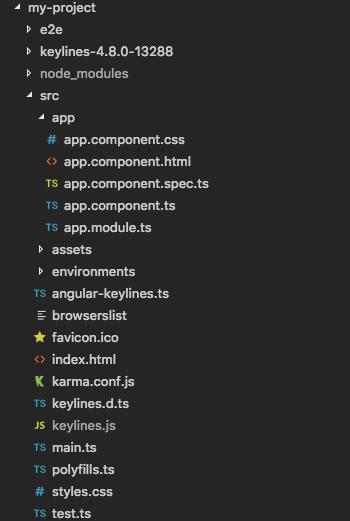 Move angular/angular-keylines.ts into the src/ folder. This file contains useful examples of how to declare KeyLines components in the Angular style. Move ts/keylines.d.ts into the src/ folder. This contains detailed type definitions of KeyLines functions, options and events to make coding in TypeScript much easier. Move the contents of the /assets/ folder into src/assets. This contains the image file directory that includes icons for chart navigation controls. A quick note about the KeyLines assets folder. If you followed the instructions and moved it to “src/assets”, you don’t need to do anything. If you moved it to another folder, you’ll need to include a reference to its new location in the “assets” array. Now we’re ready to start setting up the KeyLines chart in our component. To keep things simple, we’ll edit the existing application component in the src/app folder. The klReady function now gives you access to the chart and time bar objects, and in turn, the full power of the KeyLines API. 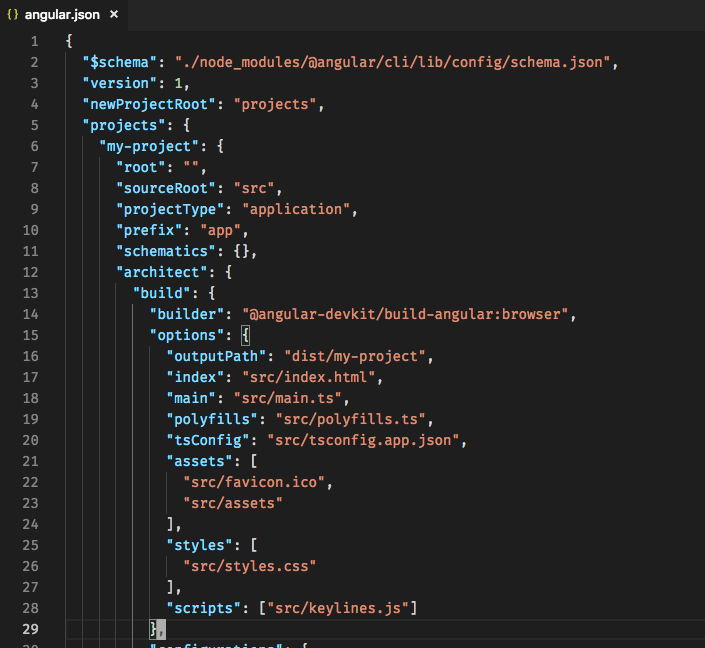 You’ve seen how quick and easy it is to get your KeyLines project set up using Angular CLI, so you can focus on developing your graph visualization application. Want to set up KeyLines and Angular in your own environment? Sign up to request a free trial – you’ll be coding in no time.